The Parent's Guide to the Medical World of Autism: A Physician Explains Diagnosis, Medications and Treatments by Edward Aull, MD Behavioral Pediatrician. It was with great trepidation that I approached this book. I knew that it was an important topic but both the title and the cover make it seem like it would be a very tough read. Much to my surprise though, the first half is light and breezy and the second is too informative to put down. This is essentially two books in one. The first half of the book is about diagnostic procedures while the second is all about medication. The author, Dr Aull, is a Behavioral Pediatrician with over 30 years of experience treating and diagnosing patients on the autism spectrum. In this book he draws upon his experience to provide many real-world long-term examples of the effects of various medications. I enjoyed the first half of the book much more than the second because it was much more relatable and because it was far less technical. Dr Aull talks about the different things that he looks for when patients enter his practice. It was quite interesting to discover that he places such a high emphasis on genetic traits. He talks about observations he makes in a child's parents during the interview and the questions he asks about the family. His personal take on Asperger's syndrome is fascinating and he ascribes many of the common symptoms to anxiety, thus increasing the importance of anti-anxiety medications. The book is peppered with stories from his experiences with patients and informed explanations of their "unusual" behavior. Dr. Aull discusses the importance of fully understanding a diagnosis before prescribing medications and the need to test several medications before settling on one which is most suitable. It was particularly interesting to hear how he uses identical twins to reduce the time required to find the best treatment for a given individual. The second half of the book is somewhat drier, dealing with medications and specifics. There is no discussion on the issue of whether or not medication is appropriate. The social questions are not part of the book and it is assumed that a parent reading this book is more concerned with choosing the right medication than a debate about whether or not medication is actually required. The medication chapters discuss different categories of medications and their use in individuals with Asperger's syndrome before moving on to discussions of medications which can assist with ADHD and sleep issues. There is a glossary at the start of the book but it's not really very comprehensive. It's probably best that when reading this section you draw out a table and put medications into the various categories that he talks about, for easy reference. Fortunately, he refers to medications by both their class and trade name. This makes it easier to identify medications you may have tried. There are some amazing insights into medications in this section which include discussions of how often to use them, how long a testing period should take and what changes parents should expect to see. There is also some discussion on how different medications interact with each other. For example; the discussion on Melatonin, a sleep medication, suggests that children should be given 45 minutes of lights out, no object (eg: ipads, books, toys etc) sleep before parents use the drug. Dr Aull also explains that as a "Natural" drug, Melatonin is less rigidly controlled by standards and as a result, different brands will have very different construction and therefore very different effects. It's all very good information. The Parent's Guide to the Medical World of Autism is a fascinating read which is presented in a way that makes its complex topic much easier to digest. If you're considering medications or if your child is already on medication, it's well worth reading. Beyond that, every developmental pediatrician should have copies available in their waiting rooms particularly as the early sections cover many of the questions that are likely to occur to parents only after they have left the doctor's office. 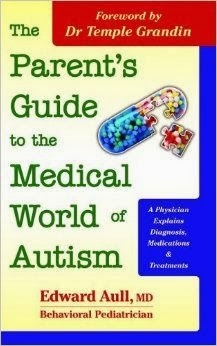 The Parent's Guide to the Medical World of Autism: A Physician Explains Diagnosis, Medications and Treatments by Edward Aull, MD Behavioral Pediatrician is pretty much a one of a kind book that provides some amazing and helpful unbiased insights into medication. It is available from Future Horizons publishing and Amazon. I was provided with a copy of The Parent's Guide to the Medical World of Autism: A Physician Explains Diagnosis, Medications and Treatments by Edward Aull, MD Behavioral Pediatrician free of charge for review purposes.